A retrospective of this time hardened Peak District crag by Keith Sharples. Ever since its halcyon days of the 60s, Stoney Middleton Dale has been up there in the higher echelons of White Peak crags. Without a few Stoney classic test pieces under your belt, your CV can only be considered lacking. Nor can you play the Stoney hasn’t any routes at my grade-card as routes start at VS and go all the way up to E6/7. There’s also a plethora of climbing styles as wall: walls, corners, overhangs and cracks. Stoney has them all, so there’s no get out there, either. So if your CV has no entries, then sit down and let me give you the low down; you’re obviously in need of Beta and a tick list. If you ask Peak District climber over 35 about Stoney they’ll proabably start telling you their own personal Tom Proctor story. Tom, you see, was Stoney – it was his crag not literally, of course, but figuratively. For 14 years between 1966 and 1980 he spearheaded the development that underpins Stoney today. There was, however, life at Stoney before Tom Proctor, just. The first ascent of Aurora by Frank Elliot in 1933 was, for example, adjudged sufficiently meritorious as to headline in the Sheffield Telegraph. However, very little else was done until Joe Brown, Ron Moseley, Slim Sorrell, Nat Allen and Don Champman of the valkyrie club arrived in 1950. 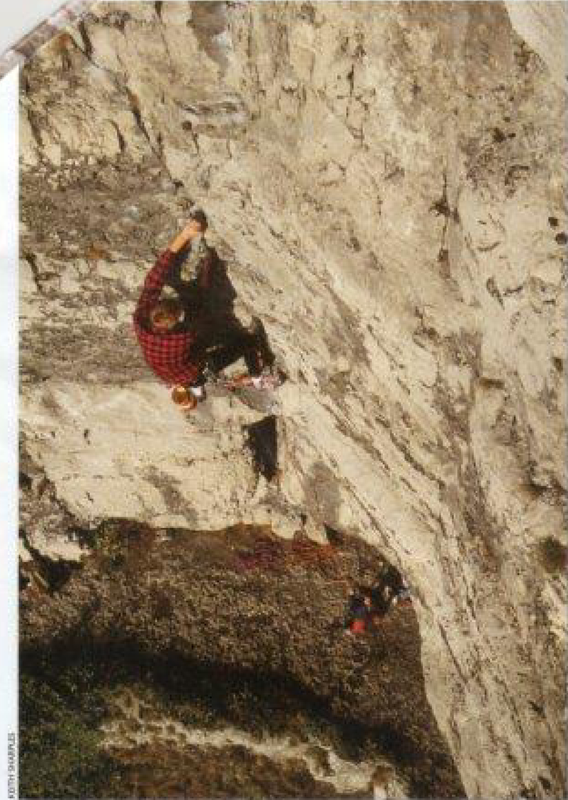 With less than half a dozen recorded routes at that time the crag was ripe for the taking. Usually, however, their contribution was limited. Whillans joined in a couple later, but even he failed to record anything of real merit. When the Mancunians, by then Rock and Ice, left, they’d only swollen the recorded routes to a dozen or so. Sin (VS 4c) was their finest addition. It was considered ‘Exceptionally Severe’ by first ascensionist Ron Moseley and the group. Surprising, Brown chose to aid Brown’s Overhand/Kink (A3) on Windy Buttress rather than to attack the blatantly obvious cracks of Medusa or Gesemini. Considering that they knocked off similar cracks on the grit e.g. Elder Crack, Peapod and Left and Right Eliminates, this is perhaps a little surprising. Presumably, the acres of vegetation-free grit on the nearby escarpments were just too appealing. In the event it was left to local Sheffield university lads to grasp the nettle and gardening equipment in the late ’50s. Overcoming the tremendous aura that pervaded limestone climbing at that time, they attacked Stoney – hard. Dave Johnson and Dave Mellor headed up the group and were assisted by Jack Soper, Ron and Brenda Salt and John Child. Gabriel (VS 4c) and Minestrone (HV5 5a) were their best free efforts which they followed with Windhover (VS & A2) and Kingdom Come(A3). Theirs was a short three-year stay though, they left Stoney once their studies in Sheffield were complete. 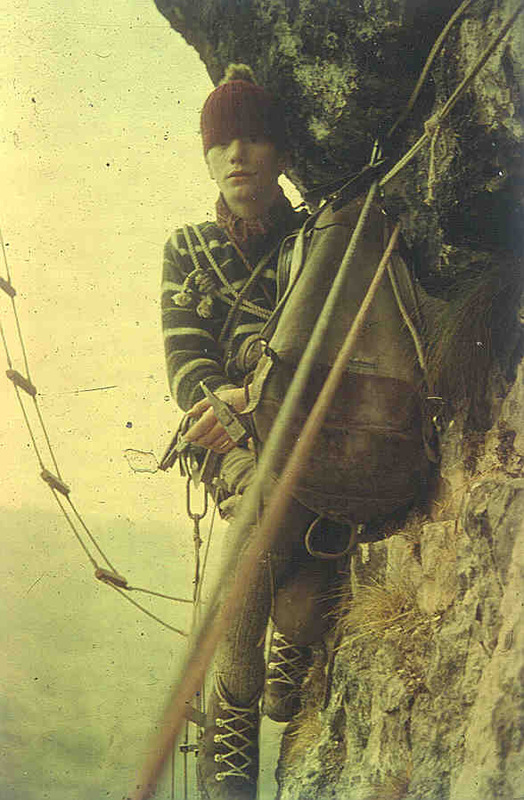 Above: A 16 year old Birtles on the first ascent of ‘Little Plum’ on October 1963. Little of significance, was done until Barry Webb and Len millsom respectively did Compositae Grooves (HVS 4a, 5a) and Medusa (hvS 5a) in 1961. Both were significant ascents, although an ascent of Meduasa was long overdue. 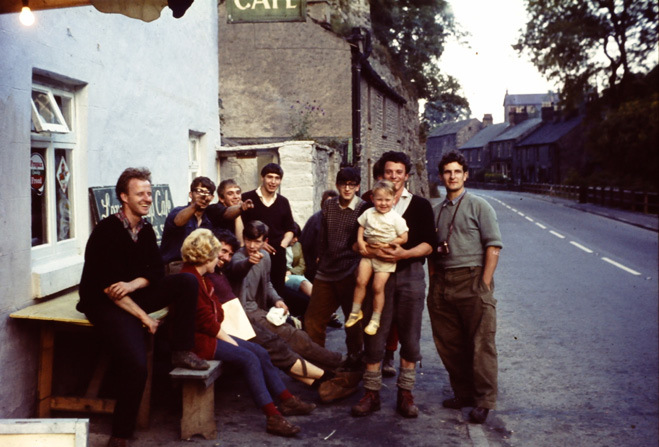 By 1963 the Cioch Club had arrived: Jack Street, Chris Jackson, John Atkinson, Brian Moore and Geoff Birtles taking residence in the Dale at weekends. Using aid only when necesery, they established some ground-breaking routes. Street and Birtles forced Jasper over a three-day ground up siege in September 1963. Street wnet on to lift the plums, Dead Banana Crack (HVS 5b) and then the very serious Boat Pusher’s Wall (E3 5c), Little Plum(A3) and Alcasan(HVS with five aid points) by Jackson and Birtles date from this time. (E2 5b) and then established such test pieces as Wee Doris (E4 5c) and Our Father (E4 5a). At the time of Tom’s first ascents these routes represented the sharpest of cutting-edge developments. Our Father in particular was proper ‘ard for its time. 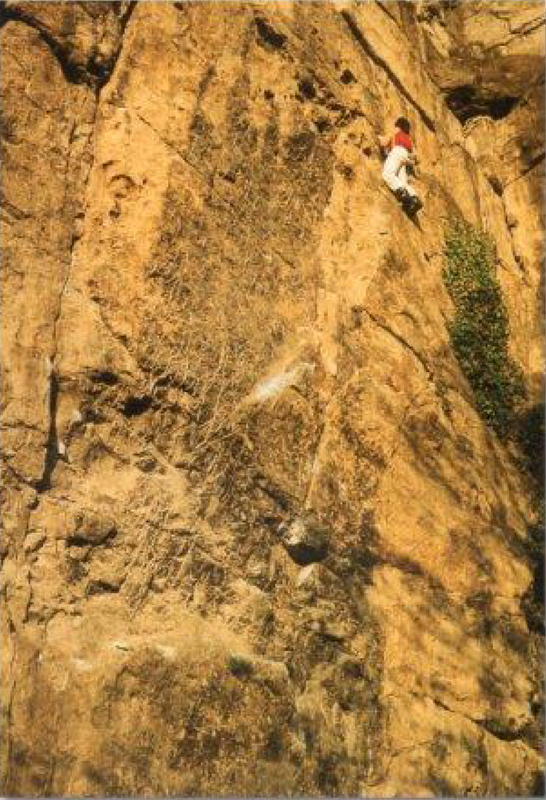 The stories of Tom soloing up the start in his Hush Puppies demonstrating the crux and placing nutes for would-be hopefuls are legendary. Tom pressed on with his developments regardless. The absence of sticky boots didn’t present a problem either; what you ain’t had, you can’t miss. It’s doubtful anyway whether any of these ‘modern’ developments would have made any difference to Tom’s climbing output, he was strong enough to crank the routes anyway. During a glittering 14-year span Tom added many routes of which Kink(E5 6b now, but E3 6a then). Circe(E5 6a), Traffic Jam(E5 e6) and Four Minute Tiler(E5 6b) were amongst Tom’s later test pieces. Repeats were rare events and usually attracted press attention. There were however, incursions into Tom’s activities by other teams. John Allen, for example, created Belinda(E4 5c) and reduced the aid(to one rest point) on Kellogg. 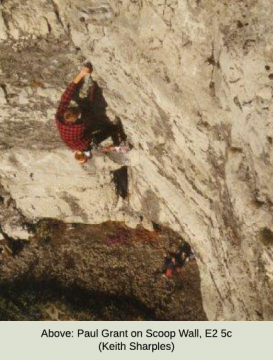 His partner in arms, Steve Bancroft, fared a little better adding several routes of which Emotional Rescue (E5 6a) in the Quarry was by far the best. Bancroft’s soloing efforts, however, were much more noteworthy. Equally conspicuous by their absence were the Great Yorkshire double act of Pete Lively and Ron Fawcett. Fawcett alone was to get into Stoney’s history wit his daring and little repeated The Heat(E5 6a) and the first free ascent of Pickpocket(E4 6a), a limited contribution considering Ron’s frequent visits to Stoney. In 1996, Gordon Stainforth, whilst researching his book ‘The Peak’, was sent to Kent to meet Frank Elliott, the legendary climber from the 1930s who made such climbs as ‘Elliott’s Unconquerable’ at Cratcliffe and in this instance what became known as ‘Aurora’ at Stoney Middleton. FE: I know it took us all day to do it. We kept going up a bit and down a bit, and got our way up, and so on. We tried different routes; there was a lot of gardening. It was pretty rotten. There was tons of loose rocks. we were chucking it down all the time. It starts with quite a sheer buttress and there’s a bit of flap on top. And we had an awful job to get up that one… we got to a ledge. I wasn’t in the lead all the time, no, I think Gilbert Ellis did a bit of leading as well and Dover, I think, was on that climb, both of them. Yes, the three of us. I think we probably had a longer rope by then, one of those Belfast Ropes. They looked like a Beal’s rope. It’s a hep, but it’s a slightly different hemp. The Nottingham Mountaineering Club used to get these from Ireland, half-inch and you could get a line, a climbing line. We usually had about 3/8″ diameter climbing line, for long leads, it was strong, but nothing like nylon. Q: Did you use pitons? FE: We never used pitons for years and years. I used them eventually in Wales. Q: So how would you have attached yourself on a thing like that? Gabe Regan was far more successful in snatching plums from under Tom’s nose. Bitter Fingers(E4 6a) and Scarab(E5 6b) were Regans best and hardest efforts respectively. Bitter fingers became an instant classic, though Scarab was an odd addition using, as it did, two aid points. Tom eventually evened the score a little on Mr Regan when he found a left hand variation that enabled the aid to be avoided. 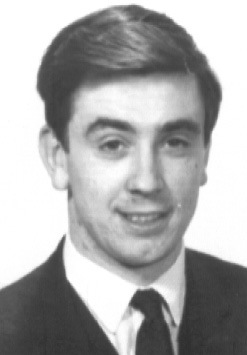 Finally Tom’s long-time partner Geoff Birtles also enjoyed considerable new routing success. Birtle’s routes in the Quarry, Millionaire Touch(E4 6b) and Oliver(E4 6a), remain amongst Stoney’s best. 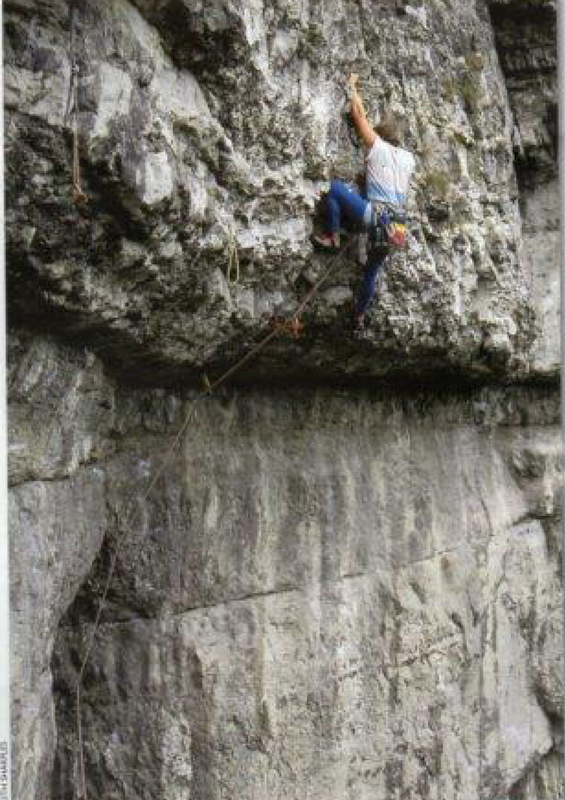 Steve McClure on a Proctor classic, ‘Lucy Simmons’ E2 5b. The cover of Crags 21 featured Tom busting a gut on a line which was clearly fairly gnarly. A blown finger tendon was the result of his attempts at one-finger undercutting in a pocket on the crux bulge. The route was to become Menopause(E5 6b), but it gained infamy as the route that Tom didn’t do. The year was 1980 and the then so-called brat pack was on Tom’s heels eager to take on the job that he’d begun. Chris Hamper and Jerry Moffatt, amongst others, were limbering up in the wings. In the event Hamper was first into Tom’s shoes for the first ascent of Menopause. Moffatt, for his part, consigned first Helmit Schmitt(E6 6b), then Black Kabul(E5 6a), Hysterectomy(E5 6c) and ultimately Little Plum(E6 bc, 6b) to the history books. Only two years had passed but standards had risen by a substantual margin. 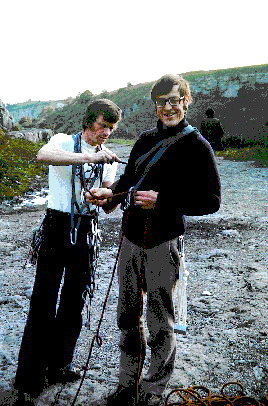 Content with Little Plum, the crag’s hardest route to date, Moffatt was to concentrate his efforts elsewhere. As is often the case, the vultures swooped for the pickings. Andy Pollitt established Easy Skanking(E6 6b) and Virgin on the Loose(E6 6b), Mark ‘Zippy’ Pretty nabbed his jam sandwich(E5 6b) and Quentin Fisher completed what Regan had started a decade before when he established All Systems Go(Eb/7 6c), a seriously difficult and run-out ascent of Scarab’s original aided line. The BMC’s fourth Series Peal Limestone Stoney Guidebook was published in 1987. The Crag was worked out, or so the word on the street had it. Sport climbing was starting to happen and the pickings were greatest away from Stoney. That said, even at this traditional bastion, the bolt made an appearance. Sure, there were bolts already at Stoney, but these were either old, decrepit golos from time immemorial(e.g. Kingdom come), or else replacements which protected crucial sections of modern classics(e.g. Circe, Little Plum). Big Boris by Nigel Slater, My Personal Pleasure by Zippy and the aforementioned Virgin on the Loose by Pollitt. But the floodgates remained ostensibly closed, these sporadic incursions being the sum total of new bolting activities. The thin end of the bolting wedge never really appeared at Stoney. 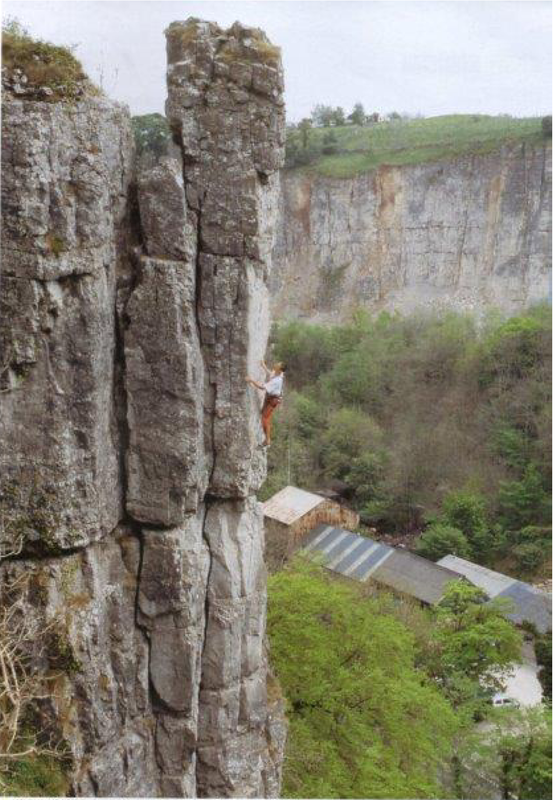 in a bizarre and amusing twist it was former anti-bolter, Paul Mitchell, who added the first, and one of the few, all-bolt routes, Ozone Bozo(F7c) to Garage Buttress in 1989. Somewhat incredulously, soloing has also taken Stoney into the headlines on more that one occasion and given the height and nature of Stoney most folks might be excused for thinking that this was more than a little ‘out there’. In the most spectacular manner possible, Steve Bancroft had started ‘modern’ soloing at Stoney when he transformed Wee Doris from a cutting edge route to a food solo in less than a decade. Bancroft’s 1975 solo of we Doris set an electric pace; the stakes could only go higher. Mark Stokes continued the trend with Pickpocket a couple of years later and then Phil Burke went ‘high’ rather than ‘hard’with a solo of Scoop Wall. Subsequently both Nick Plishko and Phil Burke pushed the boat out when they soloed Our Father. 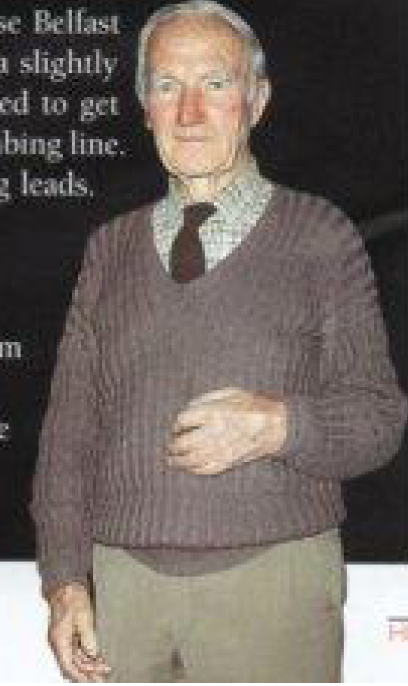 However, Simon Nadin surpassed every body’s efforts with an audacious solo of Menopause in the mid-80s. Not even Ron Fawcett, who has soloed widely across the crag, couldn’t or rather didn’t(perhaps sensibly) try to match Nadin’s efforts. And so the days of the Stoney Soloer come to an end. Extreme Rock, which had been published at about that time, spawned tickers busy collecting scalps for their trophy cabinets. Perhaps fired by Diadem’s opus, which featured a fair selection of Stoney’s classics, interest and activity at Stoney remained steady. Standards had risen significantly during the ’80s and the decade closed with many of Stoney’s classics trading as training routes rather than test pieces. The top rope was omnipresent for a while as locals threw laps on former cutting edge routes as part of their training regimes. At one point even a pull-up bar appeared, saddled between two convientley positioned tree branches. In, perhaps, a final downturn of fortune, wee Doris’s overhanging wall was rigged(intermittently) with a Bachar ladder. Stoney had become an outdoor gym for the cognoscenti and, despite all this, Stoney remained favored. Dismissed by the Peak’s sports climbers, Stoney found itlef at something of a loose end in the early ’90s, but just as it appeared to be falling from grace, bouldering started happening. Proctor, of course, had bouldered at Stoney long before bouldering was an acceptable pastime. The Womb(B7) in Tom’s Roof was Proctor’s legendary effort dating back to the mid-70s. Tom had even glued back a crucial hold on to the final section of the Womb; another first in all probability. The lower reaches of Minus Ten and Wee Doris walls were traversed, almost to death, by locals and visitors alike in the name of training in the late ’70s and the holds were quickly polished to a high sheen in the process. At the top of the Dale, Tom’s cave was also attracted attention, a traverse within its dark and murky depths being the plum to lift. Such was the interest by some dedicated locals that open fires were sometimes lit on the cave floor for both lighting and drying purposes. Nor was attention solely reserved to the crag itself as the chalk dabs the cellars and bouldering walls in ’70s. Bouldering legends, Jerry Moffatt, Pete Kirton, Quentin Fisher and Tim Freeman added significantly go Proctor’s early efforts, especially in Tom’s roof, to produce a veritable plethora of variations, most if which were brick hard. So way before the former black art of bouldering turned mainstream in the late ’90s/early ’00s, Stoney had bouldering nasties that most bouldering venues even today can only aspire to. By the mid ’80s the stamina traverses were passe replaced by the gnarly pulls of The JA (B9), Pete’s Power Pull(B11) and Jerryattricks(B11). Power was where it was at fro Stoney, long before power was where it was at everywhere else. Quentin Fisher had launched himself up Quentin’s Dyno(B8) and Malcolm Smith had pinched his way up Pinch 2(B13) and then left long before the rest of us even knew it. As the white heat of their efforts passed, the rest of us were left to flounder in their wake. Stoney bouldering hit the mags when Scots, Malc Smith and Stuart Cameron, collected a clutch of Stoney testpieces in double quick time. Stoney, in the the thick of the bouldering action, was back in the mix again. Mark Stokes soloing ‘Pickpocket’ (E4 6a) in the late ’70s. And so the new millennium has dawned and Stoney is still there for us all to enjoy. Zippy has just added Lover’s Leap(F7b+) to the ramparts of Garage Buttress. There’s life in the old crag yet it seems. Few would argue that the Tom Proctor’s era was Stoney’s purple patch. Certainly he capitalized on his strength and produced some fantastic testpieces that still stand out from their peers. He had the talent, vision and dedication to produce the goods. 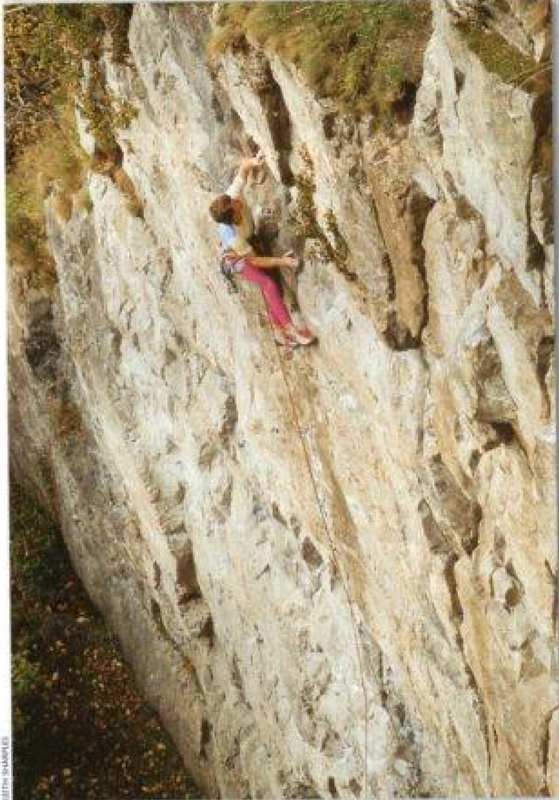 Today, with just over 50 years near-continuous development under her belt, Stoney has something for everyone, easy routes through to hard routes, polished training routes through to ‘modern’ classics, easy problems to desperate problems. The wheel of fortune is spinning, where it will stop next is anyone’s guess, but Stoney’s future is in our hands. The guidebooks might be out of print, but future is in our hands. The guidebook might be out of print, but Stoney isn’t a crag without an identity. It remains a crag-for-all. © Keith Sharples. This article first appeared in High Magazine 244, March 2003.